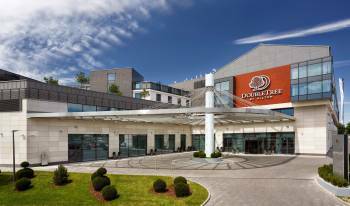 DoubleTree by Hilton Hotel & Conference Centre Warsaw is ideal for both business trips and spa getaways. Located close to the financial and embassy districts, only 25 minutes from Warsaw Chopin Airport and 20 minutes from the city center. Indulge with a choice of treatments and amenities at the hotel’s spacious destination spa, including beauty and skin care treatments, a relaxation zone, fitness center and unique indoor pool with low saline water. Garden restaurant and three stylish lounges are available, it also offers complimentary WiFi in all guest rooms and suites.